The biggest smart phone battle is now on the air. The recently crowned HTC One must prove itself against the mighty Samsung Galaxy S4. Will the HTC stay at the top or will its fall from its top position? Let's find out. In the one corner, you have the HTC One's rather wonderful aluminium body, which feels reassuringly strong, smooth and svelte thanks to relatively slim proportions. Somehow it looks a little industrial and retro from the front, which we love. You will be proud to show this device to friends. In the Samsung corner, you get a the polycarbonate plastic the Galaxy S3 was encased in. Regardless of the technical name, it feels cheaper in the hand but it does at least mean the weight of the device is kept relatively low, which is probably a good idea when the display is as large as it is. In the S4's defence, it does do a splendid job of housing a gigantic display so you won't need to stitch on a clown pocket. We've said it before and we'll harp on about it again: premium phones should feel premium in the hand, and the Galaxy S4 falls short in this area. A win for the HTC One here. If looks are largely irrelevant, the Samsung is going to impress you. You don't get a dual-core processor, or even a quad one ─ try an eight-core Samsung Exynos 1.6GHz monster comprised two quad core processors, 2GB of RAM and a powerVR SGX 544 graphics chip that will make Angry Birds and other mobile games run incredibly smoothly. Suffice to say, Samsung has once again set the pace for just how much power you can get into a phone, although the jury's out on whether all that power is noticeable or even needed. Unfortunately for the HTC One, it was never going to win with four less cores but it's still a powerhouse in its own right. A Qualcomm Snapdragon 600 quad-core clocked at 1.7GHz and with an Adreno 320 GPU behind it, as well as 2GB of RAM, makes the One almost unrivalled when it comes to performance. Ultimately, if anything can dethrone the HTC One for sheer grunt you will never use, it's the Samsung Galaxy S4 although the difference is unlikely to be great. The fact is, both phones are quicker than just about any other Android phone the world has ever seen, which is impressive. A win on paper for the Sammy here. Another close call, both the Samsung Galaxy S4 and the HTC One boast full HD screens. Yes that's 1,920x1080 pixels, just like the full HD goggle box in your living room. In this case, it depends on what you want. For pixel density and therefore clarity, the HTC One boasts a score of 468ppi whereas the Samsung can 'only' manage 441ppi. Both scores far surpass the iPhone 5's Retina Display. In terms of technology, the Galaxy S4 uses Green AMOLED technology to lower power consumption, which is a good thing when the size of the display is a whopping 5in. We're talking nearly Samsung Galaxy Note territory. The HTC One is a slightly more manageable 4.7in and uses SLCD technology. Technically this fight is a draw because, while the HTC One is more detailed and more pocketable, you may crave the impact of a bigger screen. Either way, the detail will be superb, the brightness more than adequate and the colours vivid. It just depends on whether you like the HTC One's more subtle colours and more palatable display or the bolder colours and bigger screen of the S4. Battery life is always a tough call because no two people will have the same user habits. Regardless of how big a battery is, spend loads of time on YouTube streaming HD videos and you will soon know about it. Let's look at the numbers, though. For the HTC One, you get a 2,300mAh battery that can't be removed. For the Samsung, it's 2,600mAh and can be removed. Expect about a day of solid use before plugging either device into the mains while you sleep. Megapixels mean little if a camera doesn't know how to use them. Fortunately for you, the HTC One's UltraPixel system provides pretty good low-light performance, accurate colours and the capability to capture fast-moving objects and scenes. It can also record impressive 1080p video footage. As phone cameras go, the HTC One is very well blessed and we doubt anyone would be disappointed with the results. Samsung has opted to keep things simple with a bog-standard MP count of 13. Not the most out there but definitely competitive with the Nokia PureViews and UltraPixel variants of the world. Detail is impressive, colours are spot on and, as with most recent flagship phones, the low-light capability is vastly improved versus the Galaxy S3. In terms of features, the S4 can record both cameras at once using Dual Shot, merge photos taken from the two cameras at the same time and can even record up to nine seconds of sound while capturing a photo. Knowing the stakes are high, the winner here is an especially tough choice. We're going to call the HTC One the victor here based on the quality of the shots from both devices we've seen so far and mainly because we can't see Dual Shot being used all that much. In terms of extended features, the HTC One comes with an impressive 32GB of storage, HTC's greatly improved Sense 5 user-interface and a home screen that is basically Flipboard. It looks a little like it came from Windows Phone, thanks to sizable tiles packed with images and information, and therefore all the better for it. Simplicity is sometimes what Android needs and the One really tries to plonk the essentials in an easy to find location. Even so, you can still customise to your heart's content if you so desire. 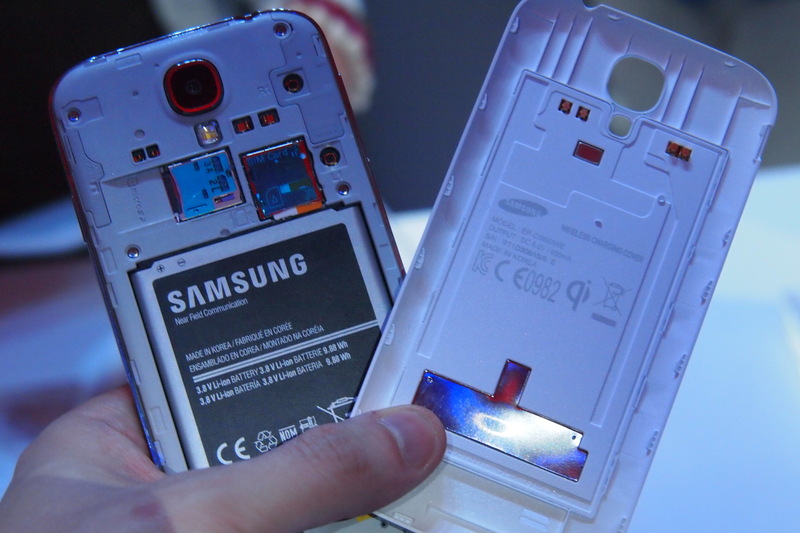 Samsung has decided to build on the S3's out-of-the-box functionality. Smart Stay – now known as Smart Pause – eyeball tracking is back, along with proximity feature Air View. Basically, it's the equivalent of hovering your mouse pointer over something. By keeping your finger near but not touching the screen, you can manipulate certain functionality such as hovering over Google images so you see a larger version without actually clicking it. The same can be applied to swiping, too. Rounding off is the S Health app, which lets you keep tabs on your exercise routine and health using the S4's array of new sensors – including temperature and moisture tracking. We questioned the need for those extras on the Galaxy S3 and we are still unsure whether the S4 benefits from having them, although Air View could prove useful in a number of situations. Therefore the victory goes to the Galaxy S4 – unless you crave a focus on simplicity, in which case, the HTC One is for you. If we counted up the wins, the score resides at a nail-biting 3-3 draw. In some ways that's a good thing because it highlights the brilliance of the Galaxy S4 and how much HTC has learned to allow it to release what quickly became our current smartphone of choice. The S4 can't hold a candle to the stylish and Flipboard-enthused HTC One. It's fresh, well designed and it could take a knock or two before warranting an expensive repair bill. But it's a little less powerful, if that matters to you, and the screen is detailed but a tad smaller. If you prefer your Android experience a little more garish and vanilla, the S4 is for you ─ if you can put up with another bout of plastic. Both phones are worthy of your money, but, assuming our review goes the way we think it will, the HTC One will hold onto its crown until the iPhone 5S.